I’ve only jumped out of one perfectly good airplane – so far. No, I don’t have a death wish, but if my skydive this past Labor Day amplifies my ability to raise money for homeless and abused dogs (and other animals), I will be doing this activity again. Sorry, mom! I also run in distance races due to my love of dogs. (I’m not ashamed to admit that dogs are my favorite “people.”) In fact, my recent skydive was part of my 2016 Rock ‘n’ Roll Los Angeles Half Marathon fundraising campaign for the ASPCA (The American Society for the Prevention of Cruelty to Animals). The Halloween race, which I will be running in for the third year in a row on Sunday, didn’t seem to quite be enough this time around – at least not in terms of raising critical funds for animals in need. To explain how endurance running and leaping out of planes help me to help dogs, I’ll flash back to June 9, 2014, when I received an email from the ASPCA. The subject line read, “You (Yes, You!) Can Run for Animals in L.A.” After “laughing out loud,” I decided to read the email. It invited me to participate in “the world’s largest Halloween half marathon” as a member of Team ASPCA. It promised I would reach my fitness goals, meet like-minded people, and make a real difference for animals in need (all were true, by the way!). At that time, I was recovering from a deep vein thrombosis and multiple bilateral pulmonary embolisms, so I took this email as a sign. It didn’t matter that I didn’t like running (so I thought!) or that I had never done anything like this before, the universe was talking to me. And I believed that I was obliged to listen. The next step was attending an informational session at Roadrunner Sports in Studio City. Since I was taking a blood thinner and still had pain when taking deep breaths, I asked if I could walk the 2014 Rock ‘n’ Roll LA Half. As soon as the Team ASPCA representative enthusiastically answered, “YES! YOU ABSOLUTELY CAN!” I signed up. Thank you, Tina Reddington! 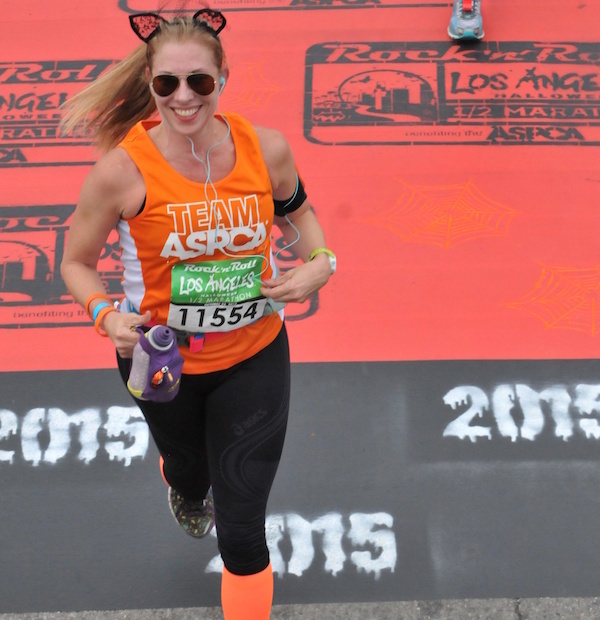 Thank you, Team ASPCA coaches, for helping me run (not walk!) 80 percent of the race. And, thanks to this life-changing experience, I’ve been running to help animals ever since. Although the big day has flown by and the tactic was a success, animals are still in crisis. In the U.S., 2.7 million dogs and cats are euthanized every year and every 60 seconds an animal is abused. That is why I hope that my skydive continues to bring donations in to my fundraising page through Sunday. If you choose to support me, 100 percent of the monies donated will go toward the life-saving programs of the ASPCA. What will I do next for dogs? I am running in the Skechers Performance Los Angeles Marathon (26.2 miles) as a member of Team Angel City Pit Bulls for the second year in a row in March 2017. So, perhaps another skydive is around the corner. 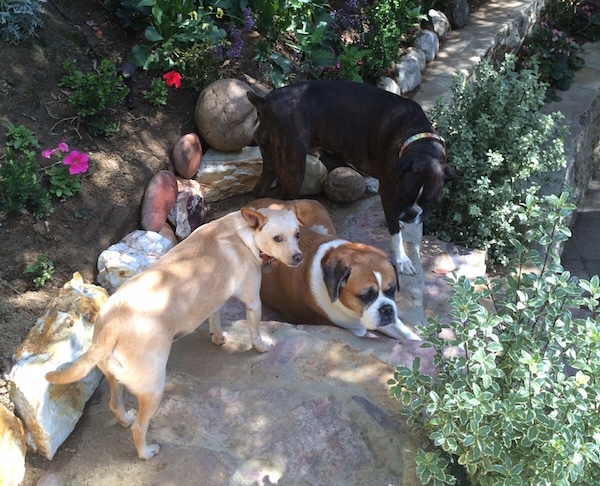 Or maybe the dogs will inspire me to try something else I’ve never done before. We shall see. About the author: Jill Hoffman is a freelance public relations and marketing professional in Los Angeles, CA. She is married without children (human, anyway). Her furry family includes three rescue dogs: Delilah, a 13-year-old female Boxer mix; Piper, a 6-year-old female boxer mix; and, Edison, a 4-year-old male Chihuahua mix. She also currently has a foster puppy named Alabama (aka “Bamm-Bamm”), an approximately 8-month-old Chihuahua. She is a regular volunteer with the ASPCA, Best Friends Animal Society, and Angel City Pit Bulls. She always has her eye out for lost pets and has reunited dozens of dogs with their grateful families over the years. The post How My Jumping Out of Airplanes and Running Marathons Helps Dogs appeared first on Dogster.